The 12F series of PIC microcontrollers are handy little 8-pin devices designed for small embedded applications that do not require too many I/O resources, and where small size is advantageous. These applications include a wide range of everyday products such as hair dryers, electric toothbrushes, rice cookers, vacuum cleaners, coffee makers, and blenders. Despite their small size, the PIC12F series microcontrollers offer interesting features including wide operating voltage, internal programmable oscillator, 4 channels of 10-bit ADC, on-board EEPROM memory, on-chip voltage reference, multiple communication peripherals (UART, SPI, and I2C), PWM, and more. 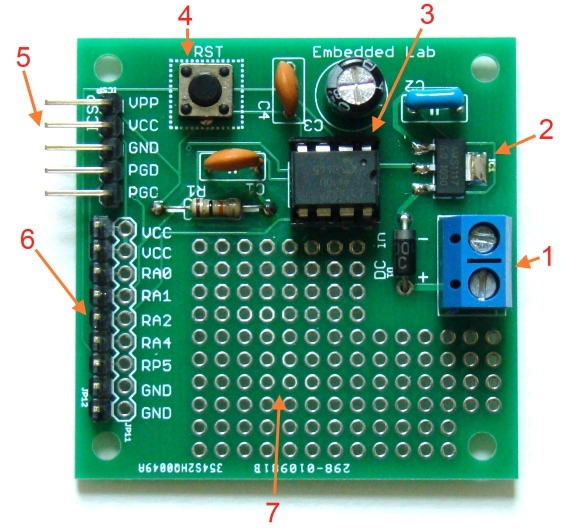 The following project board is designed for fast and easy development of standalone applications using PIC12F microcontrollers. 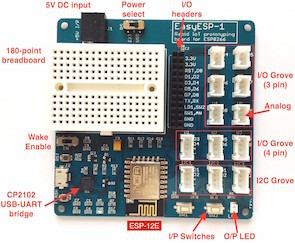 It features on-board regulated +5V power supply, header connectors to access I/O pins, ICSP header for programming, a reset circuit, and small prototyping area for placing additional components. The picture below shows a closer view of the features on board. Tact switch connected to RA3 I/O pin, which is input only. It can be used to reset the microcontroller if MCLR is enabled. Otherwise, it can be used as an user input switch. Header connector for ICSP programming using chipKIT2/3. Headers to access I/O pins and power supply pins (Vcc = +5V). Note that RA5 has been mislabeled as RP5 on silkscreen. Small prototyping area for connecting additional circuit. The regulated +5V power supply for the additional circuit can be derived from the Vcc header pins. Important: The RA0-RA5 names are used for I/O pins of the PIC12F micrcontrollers in the enhanced mid-range family (PIC12F1822, PIC12F1840, etc). The corresponding I/O pins for the old ones (PIC12F629, PIC12F675, PIC12F683, etc) are named as GP0-GP5, and have the same pin configurations. Therefore, this board can be used for both. The following program is written in mikroC Pro for PIC compiler to illustrate the interfacing of the 4-digit serial seven segment LED display module with the PIC12F development board. 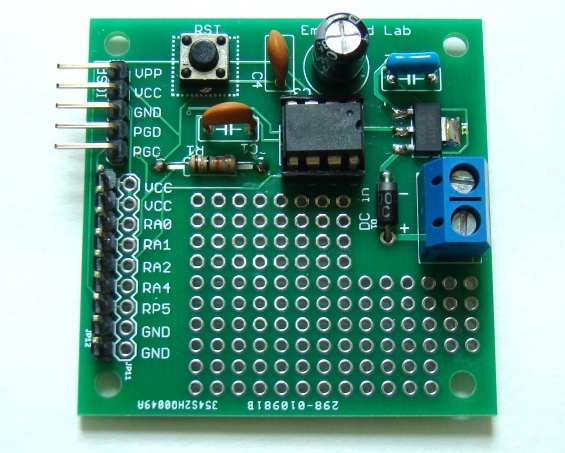 The microcontroller used on the board is PIC12F683. The GP0, GP1, and GP2 pins of the PIC12F683 drives the CS, MOSI, and CLK pins, respectively, of the 7-segment display module to create a 4-digit up-counter. The counter counts from 0000 to 9999 and then reset to zero and start again. Wondering what you can do with this board? 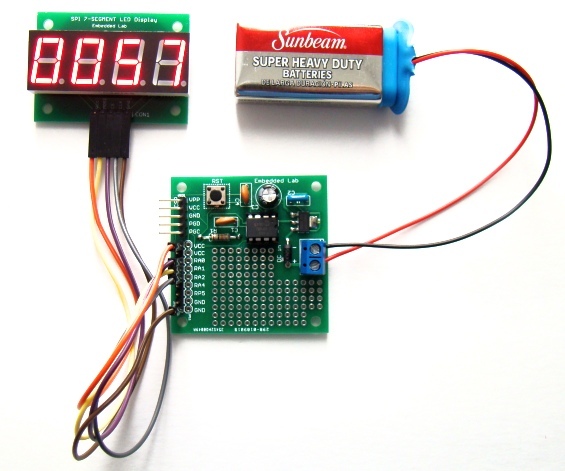 If you search online you will find tons of cool projects done with PIC12F microcontrollers. Here’s a list of few of them. Right now I have got 12 PCBs of this board. I will keep five for myself, and will give out the rest. Let me know if you need one. 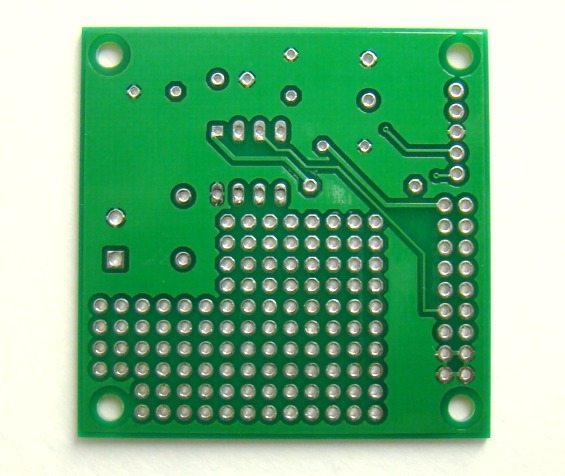 It will be $7.99 for one PCB including free shipping within the continental United States. You will need following parts to assemble the board. Four capacitors: C1, C2, C4 = 0.1uF ceramic, and C3 = 10uF-100uF electrolytic. One resistor, R1 = 10K. One 2-pin tact switch, 6mm x 6mm. One 2-pin terminal block (5mm spacing) for DC input. PIC12F microcontroller of your choice (PIC12F683, PIC12F675, PIC12F1822, PIC12F1840, etc). Header connectors for ICSP and I/O pins. I can also help you in providing some of these components along with the PCB. Email me at admin(at)embedded-lab(dot)com if you need one. I will then send you my Paypal ID for payment. Note: The pin number 1 of the PIC12F microcontroller is identified by the small square soldering pad in its footprint on the PCB. Update: This board has gone through some revisions. Please visit the following link for a revised version of this board. Nevermind I found it. Thank you. Keep up the awesome work. I need the entire circuit diagram of the board. Hi! 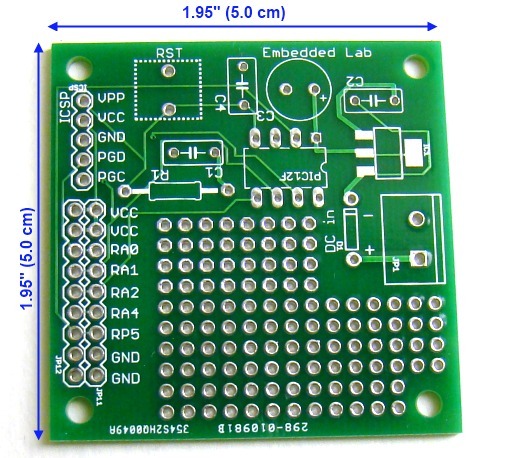 I would like to make the PIC12F breadboard. Can you send me the schematics? I don’t have it now. But I will post it soon. Did you ever get around finishing this schematic? I would like to build this on a bread board, thanks! I sent you the circuit diagram to your email id rasyoung@indiana.edu but it says it can’t be reached. Would you please include a picture of the bottom and a schematic? I have included the picture of the bottom side of PCB. I will post the schematic soon after a small revision.